Purpose: It is essential to adjust the responsibilities and function of medical education offices (MEOs) in regard to the current societal requirements. Therefore, it is a good idea to learn lessons from the experiences about the establishment and function of these offices around the world. The aim of the present study was to carry out a comparative study to investigate the function and structure of MEOs at some of the medical universities from America, Europe, and Asia. Subjects and Methods: This is a comparative, descriptive study that was conducted in 2015. Eleven offices around the world (in America, Europe, and Asia) were selected for the study. Expert group discussion and literature review were used in order to select research sample. The data were gathered using self-constructed checklists. Content and face validity of the checklist was assessed by gathering feedback from experts. The Kappa coefficient was used to determine the inter-rater reliability. Results: All the 11 offices in our study (100%) dealt with the issues of faculty development and research and scholarship activities. Only one out of the 11 offices (27%) dealt with the issues of society and patient education. Five out of the 11 offices (36%) dealt with the continuing medical education and continuing professional development. Consultation services are provided at seven of the 11 offices (64%). Conclusions: This study revealed both commonalities and differences in the function and structure of MEO among the 11 offices we examined. Based on this study, effective goals and strategies for MEO can be recommended. Addressing the current status in Iran, it is essential to adjust the responsibilities of MEO in regard to the current societal requirements. Moreover, it is critical to redesign the organizational structure and re-engineer the educational process of these offices at the MOHME. Therefore, it is a good idea to learn lessons from the experiences about the establishment and function of EDOs around the world. These findings will help to propose solutions and appropriate strategies for the quality improvement of medical education in Iranian medical universities. The aim of the present study was to carry out a comparative study to investigate the function and structure of EDOs at some of the world's top medical universities from America, Europe, and Asia. This is a descriptive study which was carried out from January to August 2015 in Iran. This study was conducted in two phases: (1) description and (2) interpretation of data and comparison. At the description phase, the phenomena are reviewed and documented based on the evidence and information, while the findings are prepared for analysis and criticism at a later stage. The description stage in this study has two phases: quantitative data collection and descriptive data collection. Quantitative data were collected in three steps. In the first step, reputable EDOs in selected countries were searched for. The second step involved the design and determination of the validity and reliability of data collection tool. The third step involved the incorporation of data through data collection tool developed by the researcher. To select the desired medical EDOs as research sample according to research expert group discussion and literature review, 11 offices around the world (in America, Europe, and Asia) were selected. The selection criteria were recognition of pioneering by relevant literature and the availability of information on the websites or in any way possible. It should be noted that the massive search did not yield a system for ranking the MEO in the world. Thus, the researchers reviewed the relevant literature and then expert group discussion to select the offices. First, the research instrument was designed as a checklist by a comprehensive literature review in accredited databases such as PubMed, Ovid, Science Direct, Springer, and ERIC. During this process, the researchers carefully reviewed the experiences of other countries and leading organizations in this field so as to employ the essential domains in the checklist, and after that, domains and the items of checklist were confirmed appropriately by one expert panel meeting. The individuals in the expert panel involved specialists and experts in medical education of Tehran University of Medical Sciences, Shahid Beheshti University of Medical Sciences, and the MOHME. This checklist included three domains, each of which contained a set of related items and a total of 14 items. Each phrase in the checklist was designed in yes or no statements. The domains and checklist items are shown in [Table 1]. To verify the face and content validity of the checklist, comments from seven experts were applied. The Kappa coefficient was used to determine the inter-rater reliability, the value of which was desirably estimated to be 0.80. The Kappa coefficient of agreement is used for inter-rater reliability, indicating to what extent the data collected in the study represent the variables measured, i.e. measuring the value at which raters have assigned an identical score to a given variable. After ensuring the validity and reliability of the checklist, the websites of the offices were explored and the results of each selected office were recorded in the checklist. This implies that for each item, yes or no was assigned to the offices. Then, the percentage was calculated for each of the offices. While collecting quantitative data, the descriptive documented data related to each of the 11 medical education centers (e.g., missions, objectives, causes of establishment, functions, and scope) were retrieved from the offices' websites. In the interpretation and comparison stage, the information described in the first phase is analyzed and classified in several tables. These tables provide a means for comparing similarities and differences between offices. In this way, the researchers after comparing the data and based on the research questions, proposed various solutions for implementation in medical education development centers in Iran that these same authors report in other study. Ethical considerations in this study include faithfulness in quoting content and accuracy of data collection. The study sample consisted of 11 selective centers in Europe, America, and Asia as shown in [Table 2]. [Table 3] summarizes the frequency and percentage of checklist items in each domain. According to the results listed in [Table 2], all the 11 centers in our study (100%) dealt with the issues of faculty development and research and scholarship activities. Only one out of the 11 centers (27%) dealt with the issues of society and patient education. Five out of the 11 centers (36%) dealt with continuing medical education (CME) and continuing professional development (CPD). Consultation services are provided at seven out of the 11 centers (64%). As shown in [Table 3], Office for Medical Education of the University of Dundee (one of the selected European offices for report in the result section of our article) is one of the oldest and renowned MEOs in the world. Till now, it is working in many areas, especially in the field of research in medical education and supply online and face-to-face programs and degrees in medical education. In addition, it is providing services to the state and international societies. The Program for Educational Research and Development is a center for research and scholarship in the Faculty of Health Sciences at McMaster University (one of the selected American offices for report in the result section of our article). Educational research and educational programs are equally dependent and the worth of both rests upon careful consideration of the best available evidence in this office, and health professions education should be informed by the general principles of teaching, learning, and assessment. They are dedicated to the development of research and scholarship in health professions education, in this faculty, locally, nationally, and internationally. The Department of Medical Education of the Faculty of Medicine of the University of Colombo (Medical Education Development and Research Centre in the past) (one of the selected Asian offices for report in the result section of our article) delivers educational support to the medical teachers as well as to other faculties in the state and the Post Graduate Institute of Medicine. It has many partnerships with local, regional, and international institutes of health, medicine, and medical education. Their activities include research in medical education and related areas, curriculum development in health professions, review and evaluation of the MBBS course (Bachelor of Medicine and Bachelor of Surgery), and providing educational support for staff and students in teaching/learning, assessment methods, and in educational research [Table 4]. According to the results listed in [Table 2], the maximum and minimum values for all items of checklist were 100% and 9%, respectively. All the 11 centers (100%) dealt with the issues of faculty development. It is worth noting that this subject is carried out in partnership with collaborating centers titled faculty development centers such as the Centre for Research in Education at the University of the Toronto (Wilson Centre), Centre for Medical Education of the McGill University, Medical Education Unit of the University of Singapore, and Program of Education and Research Development at the University of Macmaster. Similarly, one of the primary purposes of the establishment of EDCs in Iranian health science universities is the identification and dissemination of knowledge in the field of medical education. Therefore, one of the most important current tasks of these offices across Iran concentrates on faculty development programs. The measures taken in these centers include several educational workshops in the fields of curriculum planning, introducing teaching methods, introducing modern methods of evaluation, and supporting teachers to attend seminars and conferences. In a qualitative study titled “Expectations of faculty members of Iranian health Sciences University from education development centers,” Changiz and Yamani found that the participants' expectation's highly depended on the educational role of these centers. Our results showed that 100% of the offices focused on the research and scholarship in their mission and activities. Moreover, the major activity of centers such as the Centre for Research in Education at the University of Toronto (Wilson Centre) and the Centre for Health Education Scholarship at the University of British Columbia were engaged in research. It should be noted that in the mission statement for a number of centers, empowerment of faculty members in research and teaching problem-solving through research and scholarship were greatly addressed. The concept of scholarship, especially educational scholarship, has been introduced for the past two decades in many universities of health sciences in Iran. The focus has been shifted onto this field by the inclusion of this concept in “Academic Promotion Bylaw” for faculty members in Iran. It is now considered as a mandatory component for academic promotion., The definition of scholarship in Iran is extended to any kind of academic activity in the areas of discovery, educational development, application of the results of original research, information integration from different disciplines, and innovation in the field of medical education. Outstanding educational scholarship activities include all activities that occur at different levels in educational process of universities in Iran. Only one out of the 11 centers (27%) dealt with the issues of society and patient education and the issues of patients involved in teaching medical students. The Institute of Medical Education of Leeds University deals with diverse activities, such as “patient learning journeys,” visiting patients in classrooms, patients' participation in student evaluation, research on the problems of patients, patient visit at home and providing continuing care for cancer patients to increase patient participation in teaching medical students, and patient education issues in the curriculum and engaging students in the society. Nowadays, it is more crucial than ever to address the societal approach, responsive education, and patient-centered medical education in Iran in order to meet the real needs of the society. What is certain is that changes in medical education programs should enhance the capabilities of graduates to identify community health problems and provide care to maintain the health of the population. In this regard, the MOHME in Iran since 1985 has been training human resources in the health sector, to thereby integrate education and service as one of the objective manifestations of improvement in medical education programs. Moreover, the ability of a physician to better meet the needs of community health depends on the availability of appropriate fields during medical training. Therefore, one of the policies is to fulfill the real needs of the society along with medical students' teaching. Despite impressive successes in this area, we should acknowledge that there is a long way to go for a full implementation of community-oriented medical education at the universities of medical sciences in Iran. This problem can be associated with serious obstacles, such as the lack of clinical departments involved, lack of funds, lack of appropriate units (area), and uncertainty regarding the implementation of community-oriented medical education. In this regard, several studies regarding the factors affecting the implementation of community-oriented medical education have been conducted in universities affiliated to the MOHME. Efforts have been made to experience the world's leading universities in the institutionalization of community-oriented medical education.,,,,, Furthermore, in the medical education development centers of some universities of health sciences in Iran, “Responsive Education departments” were established. Activities of these departments are leading, monitoring, and supporting educational programs. They also benefit from the support of the MOHME and Universities of Medical Sciences and cooperation of educational departments for planning and implementation of education programs responsive to the society so as to introduce highly competent graduates into the Iranian health-care system. Five out of the 11 centers (36%) dealt with the concept of CME and CPD. These centers include the Centre for Medical Education of Dundee, Program of Education and Research Development at the University of Macmaster, Department of Educational Research and Development at the University of Maastricht, Department of Medical Education at the University of Illinois, and Institute of Medical Education at the University of Leeds. For example, CPD programs at the Institute of Medical Education, University of Leeds, include workshops, conferences, e-learning courses, and opportunities for shared learning through networking of medical education specialists (mentoring network). Furthermore, in the Department of Medical Education at the University of Illinois in Chicago, there are numerous licensed continuing education programs for the health-care teams involving a series of seminars/conferences. In Iran, there are continuing education departments at universities of health sciences supervised by the MOHME aiming to promote health through providing continuing education to all graduates, whereas there are CME centers in our study under the supervision of MED; this article recommends that Iranian medical education development centers devise policies, standards, and accreditation of continuous medical education in order to improve their participation. In fact, one of the approved tasks of the medical education development centers in the country must be to offer consultation on the design and evaluation of the continuing education programs. Consultation services are provided at seven of the 11 centers (64%). These centers include Office for Medical Education at the University of Dundee, Centre for Research in Education at the University of Toronto (Wilson Centre), Department of Medical Education at the University of Illinois, Department of Medical Education of the University of Colombo, Department of Educational Research and Development at the University of Maastricht, Office for Medical Education at the University of McGill, and Leeds Institute of Medical Education. 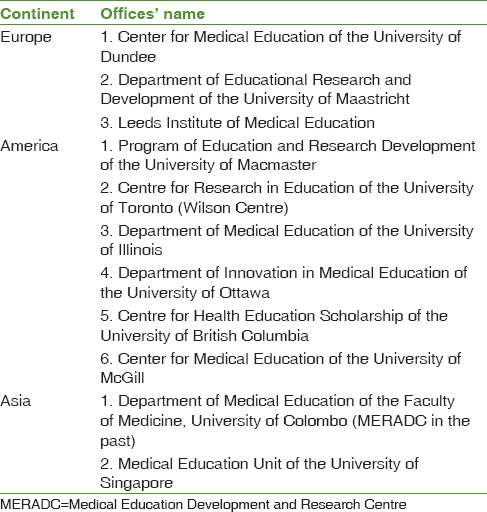 It should be noted that centers, such as Office for Medical Education of the University of Dundee, Centre for Research in Education, University of Toronto (Wilson Centre), Department of Medical Education of the University of Illinois, and Leeds Institute of Medical Education offer consultation services at the global level. For example, the Institute of Medical Education, University of Leeds, provides unique consultation services based on the needs of regional and global institutions. The consulting services at this center revolve around the curriculum design and planning, evaluation and assessment, the use of technology in teaching and learning processes, support of faculty to improve student learning, and community-oriented medical education. Apparently, this center has been pioneering in this respect. Providing scientific and consulting services in medical education development centers in Iran including Tehran and Tabriz Universities of Medical Sciences are concentrated in the development of research projects in education, curriculum reform, curriculum planning, cooperation with educational boards and cooperation between the academic centers. Moreover, one of the approved tasks assigned to the EDCs and EDO affiliated to Iranian Universities of Medical Sciences is to provide consultation on the evaluation of faculty and educational processes in their respective college or hospital, advice on the implementation of research projects in education, offer advice on different areas of teaching–learning processes, implement new teaching methods, and evaluate departments and faculty members or health-care providers. Briefly, in the performances of sample centers in this study, it seems that the majority of the centers carried out activities such as faculty development, research activities, and educational scholarship. There are also a significant number of programs based on consulting and innovation in medical education. It seems that activities such as patient and society education were observed in one center (Leeds Institute). In examining the scope of activities, it was observed that all centers provided services in general medicine field, and majority of the offices communicated with other national and international institutes. Services such as nursing and pharmacy were offered to other health-care providers. Most of the centers in this study were located in a medical school and reported to the dean. A limitation of this study was incomplete information on the website of the medical education center. Given that our research was based on existing documents, poorly documented cases might have been compared appropriately. From the perspective of researchers, it appears that it is essential to replicate this study on several medical education centers in top universities in other countries. Moreover, it is recommended to carry out a comparative study of other development centers and medical education centers in the universities of health sciences in Iran. The authors would like to express their gratitude to all of the people that participated in the study, both at the universities and at the MOHME in Iran. Ofoegbu EN, Ozumba BC. Establishment of an office of medical education: Nigeria. Med Educ 2007;41:507. 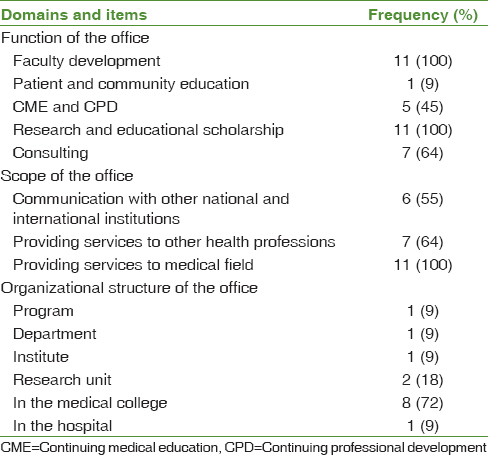 Albanese MA, Dottl S, Nowacek GA. Offices of research in medical education: Accomplishments and added value contributions. Teach Learn Med 2001;13:258-67. Davis MH, Karunathilake I, Harden RM. AMEE education guide no 28: The development and role of departments of medical education. Med Teach 2005;27:665-75. Al-Wardy NM. Medical education units: History, functions, and organisation. Sultan Qaboos Univ Med J 2008;8:149-56. Brown S. The institute for learning and teaching and UK approaches to accrediting teaching: Looking to the future. Med Teach 2000;22:513-6. Al Shawwa LA. 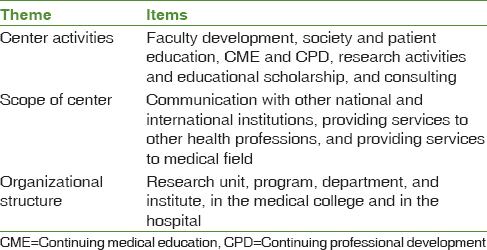 The establishment and roles of the medical education department in the faculty of medicine, King Abdul Aziz university, Jeddah Saudi Arabia. Oman Med J 2012;27:4-9. Gruppen L. Creating and sustaining centres for medical education research and development. Med Educ 2008; 42:121-3. DeZure D, Van Note Chism N, Deane Sorcinelli M, Cheong G, Ellozy AR, Holley M, et a l. Building international faculty-development collaborations: The evolving role of American teaching centers. Change Mag High Learn 2012;44:24-33. Adkoli BV, Sood R. Faculty development and medical education units in India: A survey. Natl Med J India 2009; 22:28-32. Yadegarynia D, Zarein-Dolab S, Arulanantham S. The educational development office: working for change, working with change. Medical Education 2001; 1:1-7. Viera AJ, Garrett JM. Understanding interobserver agreement: The kappa statistic. Fam Med 2005; 37:360-3.